The Stir Crazy popcorn popper is manufactured by West Bend. It has a motorized stirring rod to eliminate "old maids" and prevent popped flakes from burning. It can make 6 quarts in about 5 minutes. The popping surface has a non-stick coating. There is a clear cover so you can have fun watching the popcorn popping. In the top of the cover is a "butter well" which allows you to add butter to the popcorn as it pops. This cover can also be used as a good size serving bowl. It's important that you return the plastic cap to the top of the cover before you flip it over to become a bowl. Let me share a valuable hint regarding the butter feature. If you take a hunk of butter out of the fridge and plunk it down in the butter well you will be disappointed with the results. Probably about 80% of the butter will still be stuck there when the popping completes. There are a couple ways to handle this dilemma. One is the blow off the butter feature and prepare your melted butter in the microwave. This is the method I use. If you want to take advantage of the butter feature I recommend two actions. First, use butter that's already at room temperature, a.k.a soft. And second, cut the butter into thin slices and distribute them evenly in the butter well. This should give you the results you seek! One feature that's unique to the Stir Crazy popcorn popper is that it automatically turns off when the popping cycle is completed. This prevents burning if you get delayed in emptying the popper. The vast majority of the Stir Crazy popcorn popper users love their popper - some have used a Stir Crazy for more than a decade. Ease of use and good tasting popcorn are often touted as strengths of the Stir Crazy. Many say it's just fun to use! About ten percent of users have found the popper unsatisfactory. The most common complaint is about the poor quality of the unit. The users who were most surprised by this poor quality were ones that have been using a Stir Crazy for 6, 8, or 10 years and just replaced it with a new one. They are simply shocked by how much the quality has dropped off over the years. 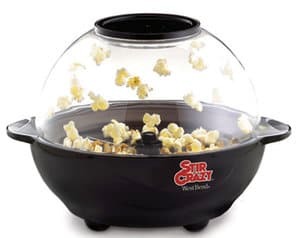 Problems that were reported repeatedly on the Stir Crazy popcorn popper were: the unit doesn't get hot enough to pop the popcorn well; the motor fails to operate; the non-stick coating begins to flake off; or the popper simply stops working. When the unit fails during the warranty period West Bend normally appears to be good at sending a replacement popper.